Concept 2: Why Anti-Clockwise Circumambulation at the Kâ’bah? First, let us say the obvious, that there must be one direction for a circumambulation ritual,[i] not a mixture of the two possibilities. Worshipping Allah and praising Him when all the Hajjis are moving in the same one direction is a reinforcement of their unity as a community. A community must do more than sit together to hear the weekly Khutbah or stand together in Salah; they must move together to accomplish the purposes of the Islamic Ummah. Their individual spiritual energies, intertwined together, contribute to a group spiritual camaraderie when they carry out any activity together. It is important for a functioning Islamic community to move forward together in one direction, united in their joint affairs. Furthermore, when we travel together symbolically around the Ka’aba, we are travelling in the land travelled by all the prophets of Allah, from Adam to Muhammad (ﷺ). The Ka’ba in Makkah is never free from circumambulators. But why the particular one direction and not another? Why an anti-clockwise (counter-clockwise) movement around the Ka’bah —rather than a clockwise direction? Specifically: The electrons of an atom orbit around their nuclei in the same manner as done in performing Ṭawwaf, in an anti-clockwise direction. Likewise the moon orbits the earth in an anti-clockwise direction. The earth rotates on its own axis in an anti-clockwise direction. The planets of the solar system orbit around the sun in an anti-clockwise direction. The sun, along with its whole solar system, orbit in the galaxy in an anti-clockwise direction. All the galaxies orbit in space in an anti-clockwise direction. Conversely, when we model the motion of the earth, sun, moon, planets, etc., we view their motion as if from above, as an outside observer looking down from the magnetic north pole of that heavenly body. This differs from our own experience on earth when we look up at the sky: From our position on earth [this time we ARE looking UP FROM BELOW as it were], we see the sun rise in the east and set in the west. That earth-bound human experience is consistent with the earth’s daily revolution on its north-south axis in an anti-clockwise direction when observed as it were from its North Pole. When we see the sun “rising” from our east and “setting” in our west, it is actually the earth which is revolving on its axis [west to east /anti-clockwise, as seen from above] relative to the sun —and not the other way around. Another way to explain this is to say that the “apparent path of the sun” [which we see looking up], or the opening and closing of daylight, which we witness daily, proceeds east to west [clockwise] across the face of the earth. This clockwise direction of movement seen by humans looking up from the surface of the earth [from their viewpoint as if from the magnetic South Pole] is the opposite of what an astronaut would see from his viewpoint in space [as if from the magnetic North Pole] looking down from above. Concept 3: Why Seven Circumambulations in Ṭawwaf? The explanation given by some scholars above for the anti-clockwise direction of Ṭawwaf is similarly adopted for the number seven: that there must be something “natural” about it, something woven into the fabric of the universe. Can we discover what is relevant to the number seven? The seven heavens and the earth and those that are therein extol His glory; and there is not a thing but glorifies Him with His praise; but you understand not their glorification. [Surat Al-Isrâ’, 17:45]. 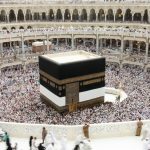 So it seems that seven is the odd number related to the forms of worship unique to one’s Hajj, including the worship of Ṭawwaf. In contrast, the worship ritual of Ṣalah is counted in pairs of rak’ât —a pair [two] is an even number— whether performed at the Ka’bah or anywhere else on earth. The first exception to the even count for Ṣalah is that a third rak’ah is added to a single pair of rak’ât for Ṣalat al-Maghrib, making a total of three rak’ât, an odd number. This Prayer, Ṣalat al-Maghrib, takes place at the time when the daylight is giving way to darkness; the second exception to the even number of rak’ât is when closing the night prayer with Ṣalat al-Witr. Ṣalat al-Witr is to be done sometime after the last Prayer at night and before dawn (Ṣalat al-Fajr), when the darkness is giving way to daylight. Concept 4: Why perform Ṭawwaf as many times as one is able? We cannot perform Ṭawwaf at any place apart from the Ka’bah in Makkah, and accordingly we are advised to perform as many Ṭawwafs as possible when we are visiting God’s house — whether we are performing Hajj, ‘Umrah, or at any other time during a presence in Makkah. The fact that there is the category Ṭawwaf al-Nafl [voluntary Ṭawwaf] indicates that there is extra reward for performing Ṭawwaf beyond those required, just as there is reward for performing more Salat beyond the minimum required. We can only speculate what might be the measurable effects of the geological forces at play in the earth at the Ka’bah —and thus the beneficial and exhilarating physical and spiritual effects of Ṭawwaf on submissive believers. This is an area of research that should be undertaken and its results made known. In the meantime we are promised the pleasure of Allah for properly completing the rituals of Hajj or ‘Umrah. We can say with confidence that worshipping Allah in the ways that He has prescribed and with the correct intent is always rewardable. Allah “loves” both required and voluntary [nafl] worship and obedience. What we can say with confidence is that we are assured of the spiritual benefits of Ṭawwaf. Ṭawwaf is prayer, so when performing Ṭawwaf, Hajjis must not miss the opportunity to send up their praise and supplications to Allah. So then, in conclusion, it is my desire to advise all people who find themselves in Makkah for Hajj and ‘Umrah to perform more and more Ṭawwaf for the benefit of their physical and spiritual health[v] and to increase Allah’s blessings. I pray that the insights presented here will inspire pilgrims to perform up to 50 Ṭawwafs —or however many is possible for their circumstances— in order to obtain the maximum benefits of this special form of worship. [iv] During the 17thcentury, India was much advanced in the world. Aurangabad (Maharashtra, India) which was the capital of the Moghul rulers was a famous centre of Tibb (Medicine) and Hakeems were available in the hundreds, and thousands of books and research works on Tibb were written by them. Some of their descendants are in existence even today. One extraordinary, experienced and intelligent Hakeem said that the circulation of the blood in a man’s body is actually 100% completed within 7 days, i.e. from the toe nails to the last tip of the hair on the head. It takes a complete seven days for all the blood to circulate in each and every micro-part of a man’s body. This practice to provide medications for 7 days was in existence all over the world. [v] In Sudan there has been a practice for hundreds of years to go to Makkah to perform Ṭawwaf for a person who is ill or not physically in good condition. The ill person used to perform Ṭawwaf for a number of times per day and then return back home after three or four months with complete fitness and good health. Is the Qur’an not Enough for Guidance?